TVRO stands for “television, receive only.” Right there, the way they worded it you know someone with a military background made that up. TVRO is a term that applies to commercial satellite dishes that might otherwise be mistaken for something else. TVRO dishes don’t do radar, they don’t connect to the internet, they don’t communicate with airplanes. They get satellite TV. That’s it. And now you’re wondering why that is really some sort of consideration. Obviously at home it isn’t because if there’s a dish on your roof, of course it’s getting satellite TV. But take the example of marine satellite dishes. Your basic marine satellite dish looks like what you see above. It’s a white gumdrop that’s somewhere between 20″ and 100″ in diameter. Yes, they really do vary that much. A large vessel could have several of them, all doing different things. So, at some point I guess you get tired of saying “not-radar, not-navigation, just-satellite-TV” and you start saying TVRO. TVRO marine dishes are these amazing little feats of technology that should not work. If you think about it, the slightest bump on your roof-mounted dish sets it off aim and here’s a dish that moves across the ocean and bobbles left and right and up and down and it’s pretty amazing that they can keep track of it. I recently visited Intellian’s US tech facility and they showed me the powerful hardware that controls these dishes. They do actually receive GPS coordinates so they can aim themselves roughly, and once they have a rough aim they’re constantly adjusting themselves to keep the strongest possible signal. It’s a combination of extremely complex logic and taking advantage of the way that satellite signals actually work. It’s amazing. 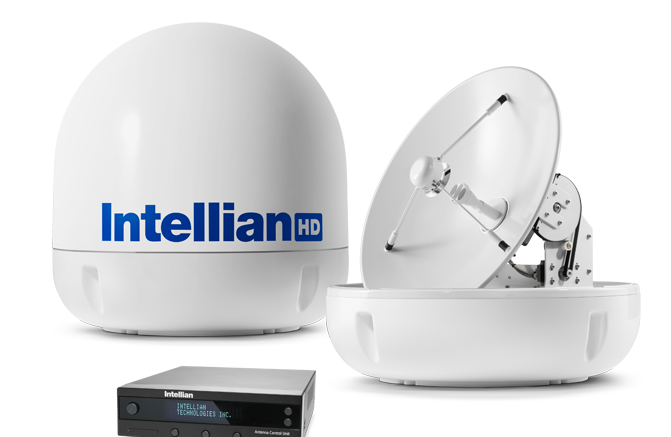 If you’re in the market for a satellite system for your boat, whether it’s large or small, I encourage you to call the experts at Signal Connect, our commercial and installation arm. We can give you the best advice and find a system that works for you no matter where in the world you are. Just give us a call at 866.726.4182! Nice and Easy: 4K on a boat? Why don’t they use solid state drives in DVRs?